Beauty Beatrix Ramosaj was excessively surprised by a bouquet of flowers she received while she was in Germany, by a devoted fan of hers from New York. Frankie Cibaku is the name of the boy who apparently for sometime now, has fallen deeply in love with the singer, who he calls "princess". Looks like it has not gone in vain his gesture of the gentleman, since Beatrix has made ​​public his affection, even by sending back warm words of love, through a message on Instagram. "I thank you with all my soul for this that you've done, I am speechless. Frankie I love you & I really hope to see you one day!! 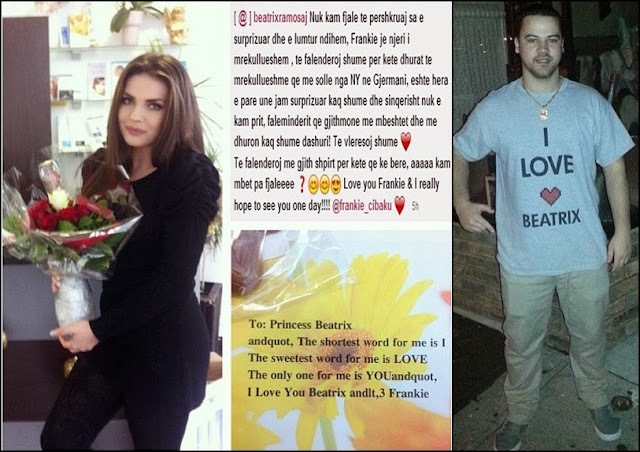 @ Frankie_cibaku", is part of the contents of her long message on Instagram, directed to the boy that she hopes to meet one day. And you never know, maybe this love of theirs in distance, may well one day turn into a real one. Quarrel for the cover of magazine "OK"